We have to give Chevrolet designers a lot of credit for giving the . Even the interior is quite sporty. Both are good things but at the end of the day, the . Instead, it’s front-wheel-drive, utilizing GM’s C1XX platform which also underpins the and . In short, it’s a car-based setup slightly adapted for crossovers. That has some drawbacks, among them the lack of a body on frame setup for true off-roading fun. But the new Blazer still has tons of potential thanks to its newfound sporty nature, like how about a Blazer SS? has cooked up this pair of rendered images showing very clearly what a potential Blazer SS could look like assuming it’s given the production green light. It’s most obvious target would be the . 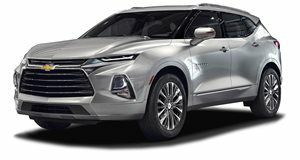 If performance crossovers are now a thing then it makes total sense for Chevy to offer up a competitor to its cross-town rival. The rendered Blazer SS you see here has some enhanced bodywork, tons of black trim (we especially dig the black hood) and the larger 21-inch wheels available on the current RS trim. There’s also a lowered suspension and beefier brakes. All-wheel-drive would be standard in order to handle the higher power output. Our number one candidate is the turbocharged 3.0-liter V6 found in the likes of the , where it produces 404 hp and 400 lb-ft of torque. A Blazer SS with this turbo V6 would outgun the Edge ST's 335 hp and 400 lb-ft. The CT6’s engine is connected to a 10-speed automatic whereas the Blazer currently has a nine-speed unit. If Chevy were to use this engine (please do, guys), then chances are a gearbox swap might be necessary. Now the question is whether or not Chevy will build a Blazer SS? Given the sudden rise of performance crossovers, we think it’s only a matter of time. 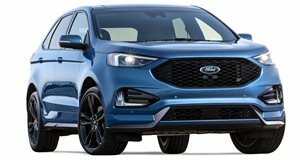 Ford shuffles the deck 10 years after the first Edge Sport. Amoral beast that it may be, the Edge ST is sympathetic to performance lovers who need utility.